In the autumn of 1914, it was still fashionable in Britain to make excruciatingly elaborate jokes about the Great War. Walter Emanuel, a columnist for the magazine Punch, wrote a satirical column about it which initiated the doggy theme exploited in this map. Johnson & Riddle, the lithographic printers behind many of the early London tube maps, created the images in a style familiar to British audiences for half a century, with a range of German dachshunds, French poodles and Turkish curs eager for offal. It was sold as a poster with the accompanying comic commentary supplied by Emanuel. The doughty British sailor stands offshore, holding the strings of his dreadnoughts, while only the bulldog’s forepaws are planted on the continent. It was a major delusion among British politicians in August 1914 that their country could do most of its fighting at sea. Winston Churchill, then First Lord of the Admiralty, wrote to the wavering chancellor, Lloyd George, arguing: "the naval war will be cheap." The foreign secretary, Sir Edward Grey, told the House of Commons on August 3rd that, since Britain was a naval power, by entering the war "we shall suffer but little more than we shall suffer even if we stand aside." In the event, a British Expeditionary Force was dispatched to France, but this initially numbered just 52 infantry battalions, while Germany and France deployed over 1,000 apiece. British troop strength on the continent increased later, but in the early months the bulldog’s back legs remained firmly planted on English soil, which is where most of King George V’s subjects thought they belonged. The allies pinned many military hopes upon the vaunted Russian steamroller. The tsar’s empire was thought capable of fielding at least 8m soldiers. It never did so, for lack of arms and equipment. In the winter of 1914, some influential voices in London argued that instead of expanding the army, Britain should do what it had so often done in the past: supply the weapons for others to do the fighting and dying. They cherished the notion of shipping war materiel to Russia through the Dardanelles, if these could be seized from the Turks. Though the plan foundered at Gallipoli, when this map was drawn hopes ran high. Uncertainty persisted about whether several neutral European nations—notably Italy, Greece, Bulgaria, Romania—might join in the struggle. Then in 1915 the Rome government made a disreputable and reckless bargain with the allies: Italy would fight in exchange for Italian-speaking Hapsburg lands and the Greek-inhabited islands of the Dodecanese. By the time these prizes were secured in 1918, the butcher’s bill for them totalled 460,000 Italians dead. 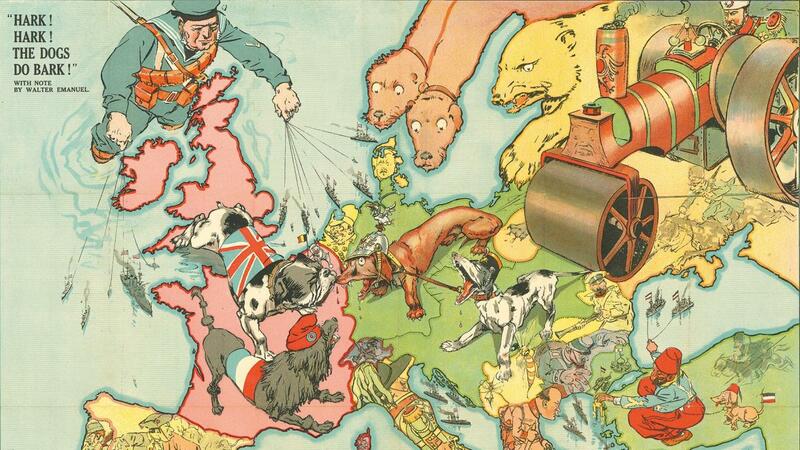 This map does a military injustice to Germany, however, ignoring its 1914 conquests. The Kaiser’s armies had overrun almost all Belgium and a quarter of France, and held most of that until 1918. Likewise on the Eastern Front, German victories had frustrated Russian hopes of seizing East Prussia. Tsar Nicholas II had always feared that fighting for the Serbs would precipitate disaster for his own regime, and so it proved in 1917. The steamroller never rolled.